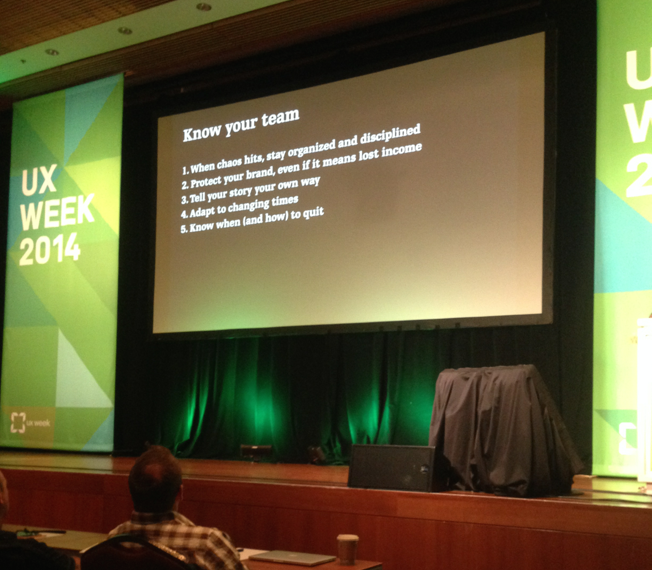 I just returned from 5 days in beautiful San Francisco where I attended Adaptive Path's UXweek 2014. It was great getting the opportunity to participate in UXweek and a big "Thank You" to my employer EMC for allowing me to attend! It was a week chock-full of presentations on the future of UX, the importance of Universal Design, and the changing roles and skill sets for those practicing User Experience (UX). There was also plenty of time to meet new UX practitioners and talk to some old friends; all-in-all it was a very busy and exciting week. Many speakers included universal design in their presentations and supported the call to action within the UX community; expressing not to forget that the "User" in our job descriptions comes in many shapes, sizes, nationalities, and physical abilities and good design takes this into account and develop solutions that align to our users. 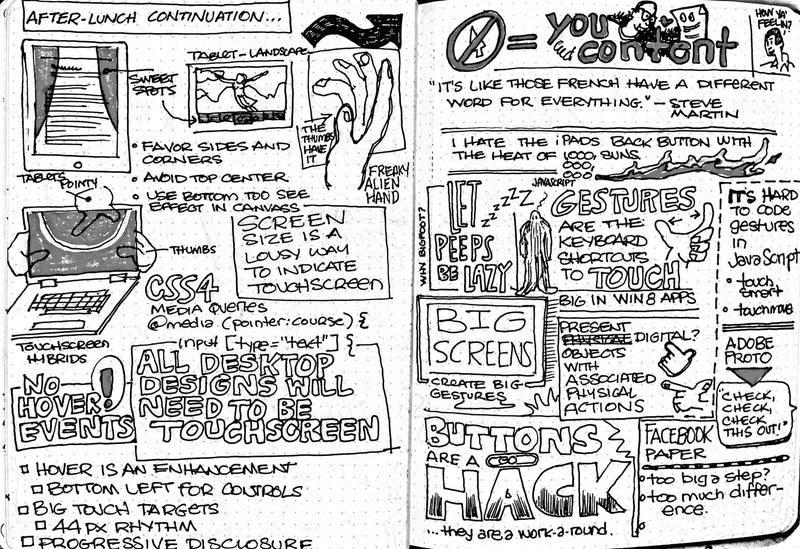 If you would like to know more about the conference I am including a link to my UXweek 2014 Sketchnotes where you can download them and get some insight into all the presentations that I attended. Each sketchnote contains the name of the presentation, the presenter, and a quick sketch of what they look like (some are better than others-speed sometimes kills). Give these a look and please feel free to drop me a line if you have any questions. I'll be putting together a bigger presentation to share with my UX peers at EMC; if possible I will also share that. A big THANK YOU to Adaptive Path, Presenters, and all the sponsors and worker bees that made it all possible. It was an awesome conference and the effects of the discussions will definitely positively affect my future work and thought. Also a big shout out to all my new and old friends that I had the pleasure of hanging out with–I hope to stay in touch with you all and please, please keep up with me and let me know what you are doing. Hi. I’m T.Scott and I am a chronic designer. Actually my profession is User Experience (UX) Architect but to be honest I was educated to be a visual problem solver…I’m a Designer! I am also a father of a child with ADHD. A bright kid who just forgets to turn his work in. I know how he feels because I too have ADHD. With one of my kids preparing for college and the other in middle school I have had a significant amount of interaction with the public school system trying to find assistance for my kids and their distinct learning styles. My UX experience has been focused on the design of collaboration portals for large corporations, both inside and outside the US. In the last couple of years my work has expanded to include social media, big data, and “the cloud.” Several years ago our company pitched an idea to the NYC Public Schools that would include providing free cloud storage to all incoming students from K-12, and through that proposal I began to think deeply about how the cloud and collaboration could benefit public education and especially help those kids like mine who struggled with the current academic structure. What follows are some of my thoughts. One of the hottest areas in public education is the standardized test. How do you make one test “to rule them all?” Even more radical what if you didn’t need to test the kids at all? What if through the use of the cloud and big data you could have an on-going record of a child’s academic progress complete with strengths and weaknesses? By implementing free cloud storage in grades k-12 we could create a vast database of the children’s assignments, discover what they were finding easy to learn and what they were having difficulty completing. The teachers could then provide supplemental materials to help boost those subjects where the students were having trouble. Likewise, using the appropriate algorithms created by data scientists we could harvest valuable information about students learning and provide appropriate options for increasing their learning potential. By capturing and harvesting the student’s data the idea of traditional testing could become obsolete. Education could be customized based on individual needs and competencies. Likewise, through the implementation of cloud based workflows and collaboration the idea of “late homework” could be dramatically reduced. I know that in our school district that when you turn in an assignment late then the highest score you can receive is a 70% (a major point of my contention). My child has had many 70% grades☺What if all schools created collaboration sites from which teachers could post assignments, store accompanying documents, and use workflows for the delivery and receipt of class assignments? An example would be… Teacher assigns a math assignment; the student receives an email with the assignment, and links to associated reference materials (e.g., digital documents, digital movies, internet sites, etc.) would be included. This would kick off a workflow that would assign the schoolwork into the students calendar where they could set-up reminders. Once the student completes the assignment the work would be checked back into their storage and the teacher would automatically receive a notification that the work was complete and ready for review. No more lost homework; late work would be vastly eliminated through the use of automated calendaring and notifications. The completed work would be queried and based on the grade adjustments would be made to address weaknesses and strengths on the next or supplemental projects. I am sure there are other avenues I haven’t touched on where this idea could be improved but I thought it might be an interesting subject for discussion here on Medium. I look forward to hearing back from others and opening up a discourse on this subject. Education is vital for our continued growth and for the future of our society. Finding ways to individualize education so that it is interesting and beneficial to our children should be of greatest importance. Finding creative and new ways to use technology to our advantage is foundational for our successful future.